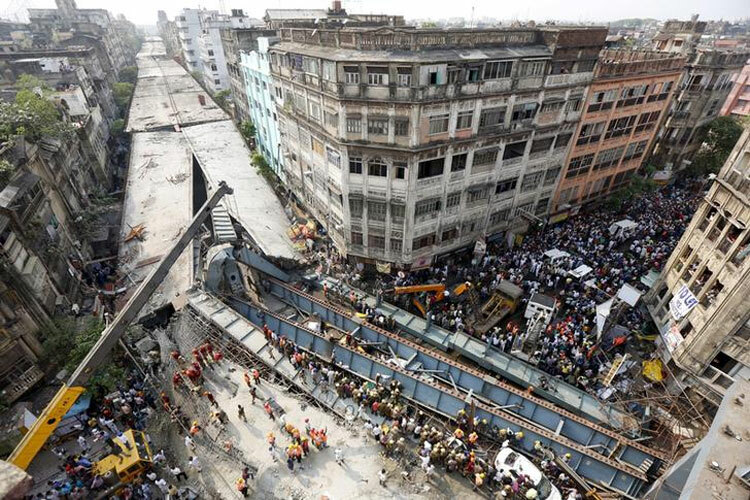 The tragedy of a flyover collapse in Kolkata, which killed 27 people, injured many others and caused damage to cars and property, is still a hot issue in West Bengal. A 2.2-kilometre long flyover, which was still under construction, collapsed when a steel span of 490-foot fell on it. But on Saturday, April 23, the last of the debris was cleared up from the spot, by an arm of the Indian Railways. On April 7, the Railways Board chairman had accepted a request put in by the state chief secretary, asking for help. It was the first time that the railways had taken up any such an assignment; usually, handling and clearing out debris is taken up by the army. Municipal bodies usually aren’t usually equipped to handle major debris such as this, which requires large-scale movers and cutters. While the dust settled after all the rescue operations, engineers from the Rail Vikas Nigam Limited (RVNL) were figuring out how to dismantle and dig out the broken structures. The flyover fell in an awkward position, with its girders sticking out close to buildings on either sides of the road. The challenge was to move the pieces without causing any damage to the buildings on the street, some of which were more than a decade old. They also had to ensure that the daily lives of the residents in that area wasn’t going to be disturbed more than it already has been since the fateful fall. The RVNL decided to bring in huge diamond cutter machines that could cut up these pieces in large chunks. Then, a 180-tonne crane was brought it to move the pieces. The grueling endeavour took about 10 days. Truckloads of chunks of concrete and metal debris were transported out of the street, and given back to the Kolkata Metropolitan Development Authority, who had been given the contract.